Wow. Utah is amazing! Zion National Park was the first stop on our roadtrip last month and the weather was prime for hiking and camping. Cool nights, not too hot days, I highly suggest a spring visit to this park. It took us about 11 hours to get to the park from our home on Tahoe’s West Shore, but we stopped for plenty of photos. We arrived to the park at sunset and chose the Watchman Campground to set up our tent. It’s more set back from the main road than the South Campground, with newer amenities. Our site was on the outer rung of the campground, providing great views of the towering Watchman right from our tent. We couldn’t secure the site for two nights though, so night 2 we set up camp at the walk-in site the next night. You have to walk in your gear, but bear boxes keep your food safe for the night, and some communal campfire spots make the walk-in sites great for groups. An extra bonus was a short, steep trail up the knoll behind our tent to a historic Indian storage site with great valley views. Day One we got right into hiking, choosing to tackle the famous Angels Landing first. A rocky cliff that juts up from the valley floor right smack in the middle of the park, it’s a one-of-a-kind hike that provides views of the canyon from every angle. You start at the Virgin River, near towering Fremont cottonwoods, on a very pedestrian friendly trail (mostly paved) trail. There are tons of switchbacks but the hike is very easy due to the mostly paved terrain. At the top of the most-traveled trail is a fork: Left leads on the West Rim Trail, along a trail affording views of Moonlight Buttress (one of Chris’s climbing goals so we made an excursion out here after Angels). Right leads the rest of the way (1.5 miles) along a spiky ridge to the top of Angels Landing. This part is not for the height-sensitive. Or is it? I am pretty afraid of heights but was so happy that I did this hike, or scramble. Lots of chains are installed to help you up the tricky sections. The slickrock topped with sand is a bit fear-inducing if you’re not used to it but you’ve just got to trust your feet. It’s amazing the amount of people that do this hike despite its difficulty. As we were going up, an older couple from Florida was behind us and made it to the top. I kept watching all the flatlanders around me and told myself that if they could do it, I had no excuse to be afraid. After descending we treating ourselves to lounging by the Virgin River in the sun, shoes off and bare feet in the frigid water. Day Two we set off for a full lengthwise hiking tour of Zion. We took the park shuttle to the end of the canyon and hiked the 1 mile approach to The Narrows. The water was too high for The Narrows to be open but when it is you can continue up canyon to ultra-narrow walls as you walk up into the Virgin River. Though not advertised, there is a small riverside trail that runs most of the way down the park. It’s a beautiful way to see the park outside of the shuttle; we were even treated to a deer herd running by us and crossing the river. Big Bend was one of our favorite stops as it’s just north of our previous day’s hike and has great vistas as the river takes a huge turn around Angels Landing. From there, we continued down the small river trail to Weeping Rock, where we hiked up to the Weeping Rock and to Hidden Canyon, for more chain-assisted hiking to a dark hidden canyon. As you can see in the below photos, the trail wraps along a cliffside for some pretty cool hiking terrain. From Weeping Rock to the next shuttle stop down canyon (The Grotto, where you get off to hike Angels Landing), there is not a good riverside trail, so you’ll need to take the shuttle. We tried to do that hike but had to hike on the road for half of it, so take my advice and shuttle it! At The Grotto, we crossed the river to the Kayenta Trail that follows the riverbank up to Emerald Pools. This trail was awesome, with great river views, mellow hiking and a cool section that goes through a split rock. 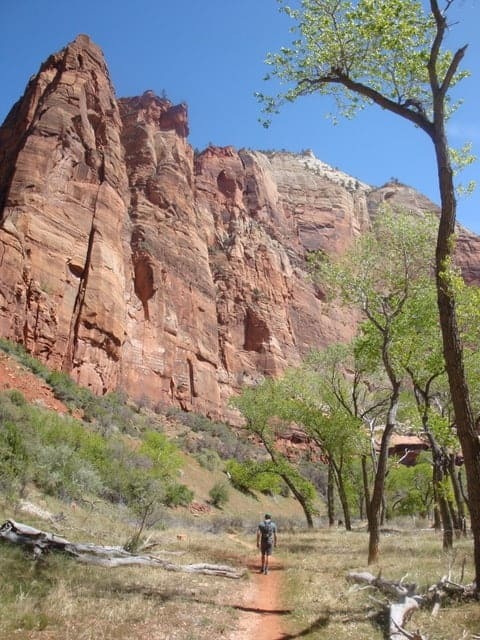 This trail is definitely one of the best Zion hikes that the whole family can do. After two full days of hiking (and a big backpacking trip ahead of us), we treated ourselves to afternoon ice cream and then dinner at the Whiptail Grill in Springdale, the town just outside the park. The chicken enchiladas with chile verde sauce are a must-order! Day Three we headed on our next adventure, toward Escalante, which afforded us a great opportunity to see the rest of Zion National Park with a drive on the Zion-Mount Carmel Highway. While you can’t drive up the main canyon, you can drive on this part, and the road takes you through a long tunnel and then out onto a dramatically different landscape that looks a lot more desert. Then it was off to Escalante for slot canyons and backpacking… which I’ll tell you all about in Part Two of this adventure. 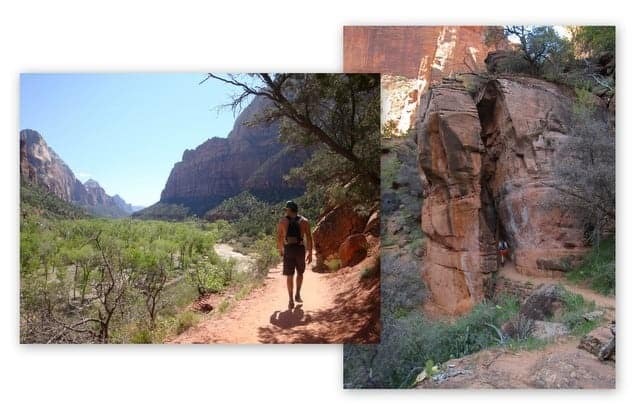 The Tahoe Mountain Sports Adventure of the Week blog series takes a walk, hike, bike, or Zion National Park hike in someone else’s shoes, from pro athletes to local Tahoe adventurers. Let us know if you’ve got an adventure to share.